The debug section in settings is used to correct issues that may occur when using OnSong. The following are switches that inform OnSong to perform certain functions when it starts up. Let's take a look at these options and how they may help get you out of a jam. By default, all media files such as audio backing tracks and background images or video, are placed inside of the backup file. This can result in large backups that are difficult to manage. 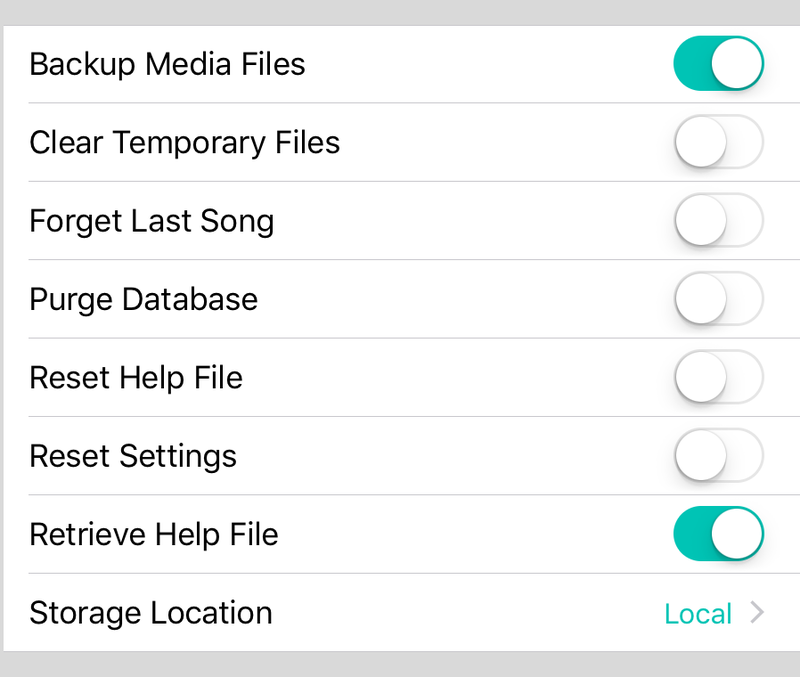 Turn this option off to prevent media files from being placed into the backup file. When you restore a library that doesn't contain media files, you OnSong keeps the records of that media, but needs to reestablish the underlying media files. If you import files of the same filename, OnSong will reestablish the media record. Turning on this option will clear temporary files when the app is placed into the background. This may be used if you are running out of storage space on your device. This is not recommended to be used otherwise as it will effect performance and temporary files are cleared automatically by iOS when needed. This is the most important debug setting to keep in mind. If you import a song that has incompatible content or is too large it may cause OnSong to crash. Because OnSong remembers the last song you had viewed, this an cause a crash loop. In that case, open the settings app on your device and turn on this setting. The next time you start OnSong, the last known song will be forgotten and the demo song will be viewed instead. This allows you to get back into OnSong and delete the offending file. Turning on this function will instruction OnSong to delete your current library and start over. When OnSong purges the database, it jettisons the library as a backup so you can restore it later. In some cases the help file in OnSong may become corrupted. Turn on this setting to delete the help file on your device and cause OnSong to download a fresh copy. This is equal to the Reset Settings tool found in the Utilities Menu. It will remove all user preferences and reset the settings back to the factory defaults. This does not remove your OnSong library. This can be useful if a combination of settings is causing a problem when starting OnSong. OnSong checks for updates to it's help file when launched. You can turn this feature off to prevent OnSong from looking for a new help file. Default is on. Local stores the OnSong library folders inside of the app. This keeps the library only accessible to the OnSong app, but also means that deleting the app will remove the library. Shared stores the OnSong library folders in an app group. This allows other, OnSong-created apps to access your library. It also means that deleting the app will not delete your OnSong libraries. You will need to delete libraries before uninstalling the OnSong app to completely remove the data. Note: most of these features are off and when turned on, will be reset to off once the action has been performed when OnSong starts up. This is by design.